The Bioscope is dedicated to peace. Here at Bioscope Towers birds twitter contentedly from the ivy-clad turrets, the sun shines daily down upon the freshly-mown lawns over which butterflies play. A babbling brooks burbles in the distance, and the only sound not gently offered up by nature is the occasional tinkling of piano (or indeed strumming of guitar) and whirr of the hand-cranked projector as another silent plays upon the screen. Likewise the Bioscope’s view upon the world is an evenly-balanced one. It observes; it does not challenge. It does not take sides. So it is with sorrow, and not a little bemusement, that we report – because it is news from our world and so we feel compelled to report it – of an extraordinary war of words raging at present around the Slapstick festival in Bristol, UK. Slapstick is a festival of comedy, silent and beyond, which each January brings together classic comedy with the live comedians of today in an imaginative concoction of popular entertainments. So, running alongside Keaton, Chaplin, Laurel & Hardy and so forth, audiences over the past five years have seen Neil Innes, Barry Cryer, Tim Brooke-Taylor, Graeme Garden, Phill Jupitus, Eric Sykes, and Paul Merton, the television comedian who has been such a fervent advocate for the art of silent film comedy. Over the past five years, I’ve taken great pride and pleasure in presenting the best silent comedies with live musical accompaniment at the Colston Hall as part of the Bristol Silents Slapstick Festival. The continued loyalty of the Bristol audience was very special to me and was matched by my loyalty to them. At the end of every exceptional Gala evening, I’ve stood on the stage and promised to return with more delights the following year. I’m proud that my name has played such a large part in building up the Slapstick Festival’s reputation. I have programmed many events and have been happy to do the lions share of publicity. So you could have knocked me down with a custard pie last August when Chris Daniels, the self appointed Director of Bristol Silents, emailed my agent to say he was dropping my Gala Night because he believed that we would struggle to sell tickets!! Merton goes on in some detail about his contributions, personal and financial, to past Slapstick festivals, and details what he feels has been mistreatment by the festival organisers now and in the past. To our dismay, Paul’s agent’s reply was that not only did Paul not like our various proposals, but that “he has asked me to let you know that he hereby withdraws from any future involvement with the Slapstick Festival.” Since then, we have made various efforts to reassure Paul that we value him but, as he insisted that all correspondence had to go through his agent, lack of direct contact may explain why Paul has formed some inaccurate impressions about the day-to-day running of the festival. 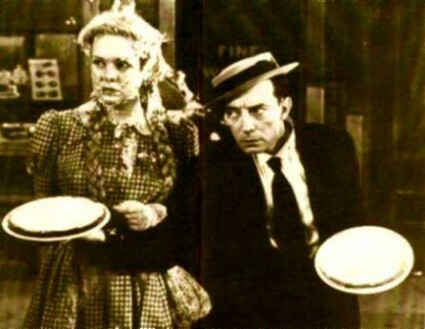 Unlike the big budget, well-staffed, production companies with whom Paul usually works, Slapstick is run mostly by unpaid volunteers whose main qualification is that they love silent films and visual comedy and are willing to put in the hours, energy and passion that enable others to enjoy them, too. The festival is run by a bona fide not-for-profit film society – Bristol Silents – which meets all of the standards of governance required by public funding bodies and sponsors, and has a steering group who advise on festival appointments and plans. To get to the bottom of this matter and come to your own conclusions, you will need to pursue the various threads of this story for yourselves (the debate on Nitrateville is instructive). What is sad to see is that people who believe in the same thing, namely the preservation of the art of silent comedy, should be falling out so publicly and bitterly. It is unnecessary, it is just a little bit ridiculous, and it should not have been aired so openly when it might have been resolved properly by diplomacy and mutual understanding. The Bioscope suggests that perhaps a leaf might be taken out of the Python book and to have the contest sorted out by a fish-slapping duel, which we have long thought believed to be a good way of sorting out wars large and small. Or it could be custard pies. 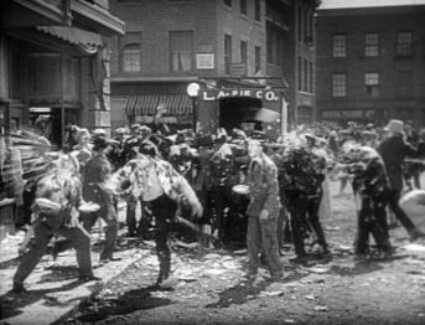 Custard pies at ten paces.